A paper published today in Quaternary Science Reviews shows 5 non-hockey-sticks from reconstructions of sea surface temperatures [SSTs] in the Southern Ocean, each of which demonstrates a long-term cooling of the Southern Ocean over the past 8,000 to 10,000 years. 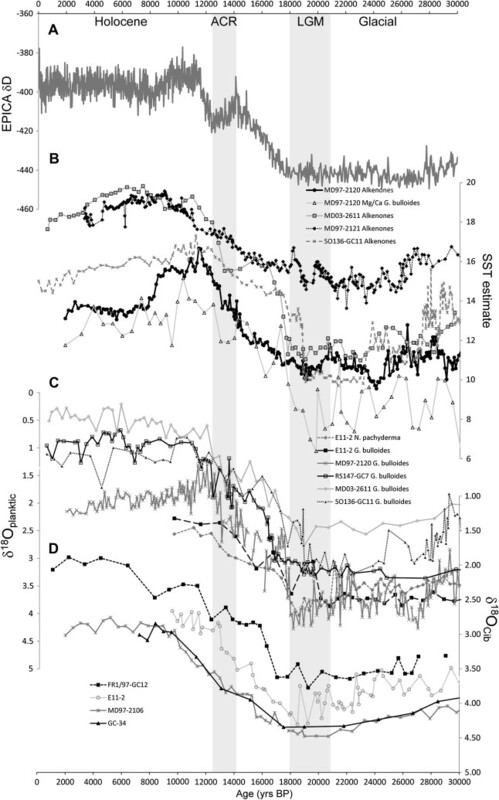 Second through 6th graph from the top show sea surface temperature reconstructions from the Southern Ocean, each of which show a cooling over the Holocene [past ~11,000 years]. Horizontal axis is years before the present. The Australia/New Zealand region of the Southern Ocean is influenced by several of the major global water masses of the oceans and is the prime entry point for cold deep waters into the Pacific basin. During the last glacial there was increased sea-ice extent around Antarctica (as far north as 55°S), as well as increased iceberg presence inferred from ice-rafted debris. Evidence from microfossil assemblages suggests that sea surface temperatures (SST) were up to 7 °C cooler, consistent with recent estimates of cooling for New Zealand derived from glacier modelling and other terrestrial proxies. The Subtropical Front (STF), Subantarctic Front (SAF) and Polar Front (PF) had migrated north, except where the position of the fronts were controlled bathymetrically. Despite the potential for iron fertilisation by increased dust input into the ocean during the glacial, there is limited evidence for higher total biological productivity in the Pacific sector of the Southern Ocean. The altered oceanic circulation during the glacial also decreased nutrients in the surface waters and affected the outgassing of CO2. This contributed to an increased storage of CO2 in the deep waters and lowering of the carbonate lysocline. During the deglaciation, sea-ice retreat and SST increased rapidly at ∼18 ka, roughly synchronous with the reinvigoration of deep water circulation in the Southern Ocean and the release of CO2 stored in the deep waters. The gradient in carbon isotopes (δ13Cbenthic) between Antarctic Intermediate Water (AAIW) and lower Circumpolar Deep Water (LCDW) was greatest at the start of the deglaciation, suggesting that the AAIW ventilation preceded LCDW ventilation, or there was a significant change in air-sea fractionation of δ13C. There was a slight enrichment in δ18Oplanktic, decrease in SSTs and a reduction in intermediate and deep water circulation between ∼14 and 12.5 ka BP during the Antarctic Cold Reversal (ACR), coincident with glacier advances in the New Zealand Southern Alps and other terrestrial records of cooling. Following the ACR, there was a second, more minor, release of deep water CO2, most likely related to reinvigoration of North Atlantic Deep Water (NADW). From 10 ka onwards the modern intermediate and deep water circulation was established. Air temperatures and SSTs reached a maximum in the early Holocene, with the STF located at its most southerly position, and there was a widespread retreat of Antarctic ice sheets to their modern position. A decline to modern SST and air temperatures in the mid to late Holocene followed. While millennial cycles overprinted on the SST and δ18Oplanktic records, may be the result of subtle changes in the position and strength of the westerly winds during the Holocene.